Part of my beauty resolutions of 2012 was to limit myself to buying only 12 nail polishes in 2012. Before December 2009, this would’ve been easy, since I didn’t even have 12 polishes in total. Well, fast forward to last week – I’ve officially FAILED my Nail Polish Out 2012 resolution. My total is now 14, and yes, I’m fully aware it’s only April. In any case, I’m pretty happy with the 14 I got. I showed my first 6 here, and below are my newest 8. China Glaze – Smoke and Ashes (The Hunger Games Collection) – A really cool black polish with green and blue shimmers. And come on, how could I NOT have gotten any of the polishes from this collection? I feel like I deserve a pat on the back for just getting one. I ❤ The Hunger Games. China Glaze – 108 Degrees – Three reasons I got this: 1) it’s a shimmery hot fuschia and it’ll look pretty in the hot months ahead, 2) I don’t have any colors like this, and 3) it was on sale at Ulta. Revlon – Craving Coral – This is more tangerine than coral, so it’ll fit in with the color of this year, declared by Pantone as Tangerine Tango. Also, refer to reason #3 from above. Dior – Waterlily – I kind of HAD to get this color. After talking myself out of getting it when it was available to madly searching for it after I decided I wanted it AFTER it was sold out online, I happened to chance upon one last bottle at a Sephora. I don’t love the color on me, but it looks like jade on the nails, and Dior polishes have the best formulas, and… ok I’m just trying to justify at this point. Still glad to have it in my collection. Sally Hansen – Pacific Blue – Jenn from MissJenFABULOUS on Youtube mentioned this in a haul, and I had to go get it. It’s the kind of blue that is bright and PERFECT. Love. OPI Mod About You – I first saw this color YEARS ago on Rumi of the blog fashion toast, and I filed it away in the back of my brain. Then a few weeks ago, I saw a woman in my yoga class wearing this, and it looked so good that my yoga instructor even pointed it out during a particularly intense session of hot yoga. Looked great against my fellow yogi’s tanned skin, so I went out and got it as well. OPI Oui Bit of Red – Refer to 3 reasons for China Glaze 108 Degrees, except substitute color as red with fuchsia shimmers. And a fourth reason: 4) Saw this on Sandra of the blog 15 steps, then a beauty blog and it looked nice on her. Sally Hansen – Ring-a-Ding! – I’ve never seen this before, so I assume it’s new. It’s touted as a “jewel overcoat” and has big chunky yellow and rose gold glitters suspended in a clear polish. Going to try this out. After seeing Judy’s obsession with nail polish, I decided to go get some (literally I had no nail polishes). A few of my friends, Emmy and Casey, are also obsessed with nail polish and do their own nails. I have been getting my nails done professionally for a long time, but recently I’ve been trying to do my own nails to save some money. It’s actually sort of fun! First off, I needed a good nail polish remover. I had been using a non-acetone one but it took forever for me to get my nail polish off. So, I asked Emily and she told me to get the 100% Acetone one from Duane Reade. I must say it works great! I have no idea if acetone is horrible for you, but it really does work. 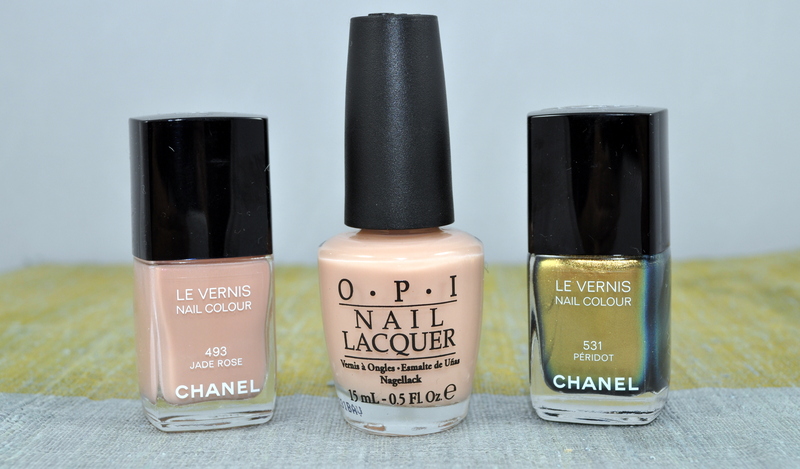 Next, when I was at Barney’s getting my mini-facial, I decided to go to the Chanel counter and ended up getting 2 nail polishes. I was inspired by Sabrina’s swatches on thebeautylookbook.com. I bought Peridot and Jade Rose. I love Peridot – it’s super gold, shiny and beautiful. Just like the swatch. I didn’t love the Jade Rose as much. It was hard for me to put on and was a little streaky. It was a little too pink for my taste as well. So, I went out and bought the OPI Coney Island Cotton Candy which I really like. It goes on smoother. I also bought the Seche Vite Quick Dry Top Coat. I’m not using a base coat – is that bad? I want to buy more colors, but every time I look online or go to the store I get overwhelmed. What are your favorite nail polishes? Please recommend some colors! !